Embark on an award-winning Luxury Expedition Cruise for the centerpiece of the Southern Hemisphere — extraordinary Antarctica, where towering icebergs, massive glaciers and abundant wildlife make for the ultimate adventure destination. Book now and save $12,000 per couple on stateroom categories 1, 2 and 3, and save $4,000 per couple on all other stateroom categories. *Based on savings per person, double occupancy. See reduced per person prices in Dates & Prices below. Offer subject to availability and may be withdrawn or reduced at any time. Note: This cruise includes regular Zodiac boat excursions, walks over uneven terrain and optional, challenging hikes. Due to the nature of expedition cruising, this itinerary is subject to change and is for guidance purposes only. Arrive in Argentina's capital and transfer to your hotel, where you spend the rest of the day at leisure. Meet your fellow adventurers for a welcome cocktail reception this evening. Latin passion and European Romance define the beautiful city of Buenos Aires, a dynamic mecca known for its wide-ranging architectural styles, contemporary and historic arts, and culinary pleasures and parrillas (steakhouses). Dive into its best treasures under the wing of expert A&K local guides, choosing from a selection of included excursions. Opt to explore the city on a guided tour complete with a tango demonstration; spend the day at an authentic estancia (ranch), where you pause for a traditional lunch; or discover a burgeoning art scene on a guided tour focused on Buenos Aires street art. Fly to the charming port town of Ushuaia, the southernmost city in the world. On arrival, enjoy a gourmet lunch at the Arakur resort, enjoying panoramic city and mountain vistas while you dine. Time and weather permitting, take a guided walk in the Cerro Alarken Nature Reserve or simply relax with a cappuccino and enjoy scenic views ofUshuaia. This afternoon, transfer to your ship and settle in for your first night on board. Wander the decks to become acquainted with the ship, relax in the lounge and mingle with fellow guests in anticipation of your voyage. From your private balcony or the outside decks, take in views as you cruise the beautiful Beagle Channel before heading out to sea. The journey south toward Antarctica is an exciting one, furthered by singular, voyage-long access to our knowledgeable Expedition Team and enrichment experts — both on board and on shore. 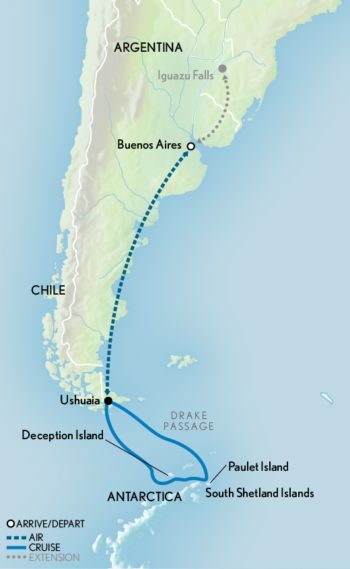 Set out into the Drake Passage, a 600-mile-wide swath of water where the Southern Ocean currents are squeezed between South America's southern tip and Antarctica's northernmost reaches. An important trade route in the 19th and early 20th centuries, its stormy waters and icy conditions once made the journey a difficult one, though the stabilizer-equipped 'Le Lyrial' handles it with ease. After lunch, join your naturalists on the deck to look for various species of whales and abundant seabirds, which join other mammals in feasting on the krill-rich waters of the Drake Passage; it's all just a taste of the wildlife you will encounter in the days to come. Later in the evening, chat with experts about the wildlife spotted today and learn about the next day's itinerary. Antarctic Sound: At the northernmost tip of the Antarctic mainland, this body of water features some of the best sightseeing on the peninsula and a proliferation of giant icebergs. Noted for its vast numbers of bird species, the sound is home to the largest breeding colonies of Adelie penguins in Antarctica. Landings here may include Paulet, Vortex or Terror islands. You may also make your first continental landing at sites such as Brown Bluff or Esperanza Station at Hope Bay. South Shetland Islands: Antarctic research stations, remarkable history, amazing geological features and abundant wildlife define these islands off the shore of the Antarctic Peninsula. Island visits may include Penguin, Half-Moon and Deception, where you may cruise into this flooded caldera to explore geothermal black sand beaches and abandoned whaling stations. Each cruise day begins with an early breakfast followed by a morning excursion on swift Zodiacs (sturdy inflatable boats). Guided by expert drivers, each Zodiac excursion is accompanied by lecturers and joined by groups of no more than 10 guests. After mornings discovering native species and striking terrain, return to 'Le Lyrial' for lunch, and time to relax and observe the wildlife-rich waters that surround you, searching for everything from fin whales, humpback whales and orcas, to Antarctic and imperial shags. By afternoon, set out for the day's second excursion, which may include visiting a working scientific research station, hiking on a sheltered beach packed with basking Southern elephant seals, or circumnavigating colossal icebergs that serve as floating homes to seals and penguins. After full days of adventure, evenings aboard your luxury cruiser invite you to unwind over cocktails in the cozy lounge before dinner in the elegant dining room. At night, choose to recap the day's discoveries with your naturalist guides; chat on deck with fellow guests; or seize the opportunity to capture photos in the stunning low light characteristic of Antarctica's long, ethereal twilight. Bid farewell to wondrous Antarctica and begin your cruise back to Ushuaia at the southernmost tip of Argentina. The ship's return through the Drake Passage is an interlude for recap and reflection, with time to compare notes with your expert lecturers on the wildlife, history and geology of the White Continent. Spend time on board with newfound friends in the comfortable common spaces of 'Le Lyrial,' enjoy quiet relaxation on your own private balcony or absorb more fascinating lectures by your captivating Expedition Team. While cruising through this historic passage, you may spot various species of whales and seabirds, including the elusive albatross and the giant petrel, an opportunistic predator and scavenger nicknamed the "stinker." The immense albatross is an especially stunning sight to behold. These wandering birds boast a wingspan approaching 12 feet and are capable of gliding through the air for hours at a time in search of food. Availability on any product or journey shown here is not specific to a category of travel and may not denote availability at the cheapest ‘From’ price. For real time availability, talk to your travel agent or call Abercrombie & Kent on 1300 851 800.